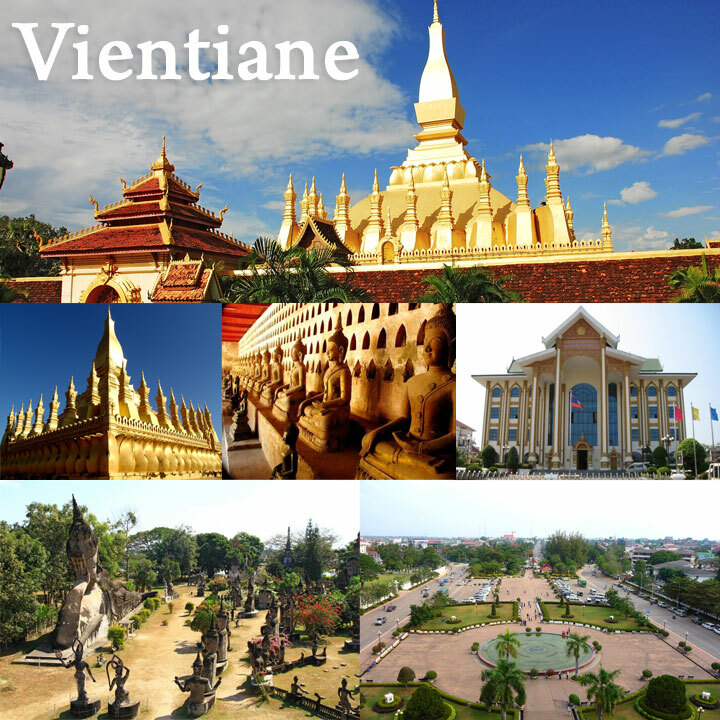 In the cold weather, when spring is coming, nothing is more wonderful than performing a spring trip to Vientiane, the capital city which is famous for being a peaceful land in the country of elephants with your family and friends. 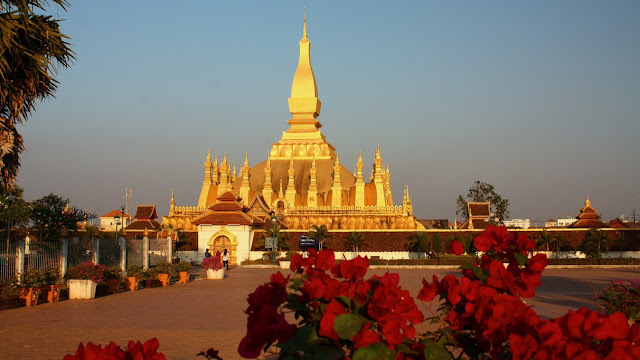 There are many ways to explore the capital of Laos. Here is the suggested schedule for a day to help you not to miss the precious moments. There are many tuk tuk waiting for you in the bus station, and the drivers warmly invite the visitors. Vientiane is 15 km from the central bus station in the capital, (located along the Mekong River) and it costs 20,000 kip/ person (VND 60,000). The central area of the county of Chanthabouly has countless hotels, motels which all lead to the main road next to Mekong River. If you stay at the hotel overlooking the waterfront, the price will be high. To save costs, you can choose the hotels on Frangcois Ngin street. 8am: Have breakfast at the rustic diner with typical cuisine of Laos. You can rent a tuk tuk for 220,000 kip (576,000 dong) to visit the famous places in Vientiane like the park of Buddha statues, Pha That Luang, Ho Phra Keo Temple and Patuxay Triomphe in the corner of the intersection. A tuk tuk vehicle can carry 6 passengers. Remember to bring cakes for lunch because the places are quite far from the center. 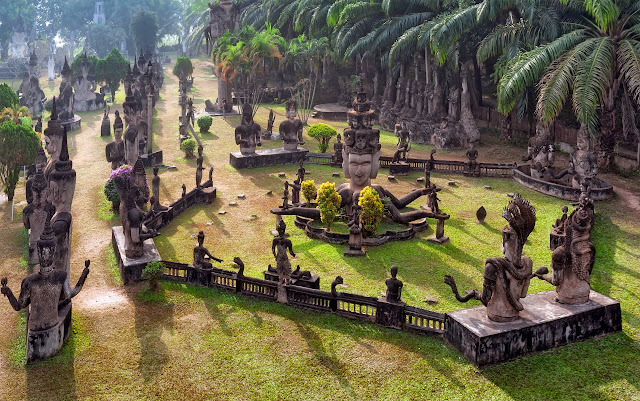 Xieng Khuan Buddha Park, located on the village of Tha Deua, about 25 km from the center of Vientiane to the east, was built in a 4-hectare campus in 1958 by monk Bounleua. The park is considered a monumental sculpture with more than 200 large and small Buddha statues with different shapes made of cement with the moss and mark of the time. There is a statue of strange shape like a giant pumpkin which is opening its mouth, inside, there are three floors representing the hell, the earth and the heaven. You can walk on the stone steps beside the narrow aisle to go to the heaven and enjoy panoramic view of Buddha statues park. Fares of visiting the statue park is 5,000 kip (15,000 dong). Pha That Luang or That Luang, situated at the end of Lan Xang road, is the world's cultural heritage, the national symbol of Buddhist country of elephants. This is the largest tower and most beautiful relic in Laos, built in 1566 on the ruins of an Indian temple from the 13th century, the outside is covered in gold. The main tower of That Luang is surrounded by three massive layers of wall, decorated with lotus petals gilded and splendid small towers. Surrounding the tower is a green lawn and the covered corridors. In the campus, there are two small temples named Wat That Luang Neua to the north and Wat That Luang Tai to the south. Entrance tickets for the Laos people is 2,000 kip, for foreign tourists is 5,000 kip (about $0.8). It is opened from Monday to Sunday, from 8:00 to 12:00 in the morning, from 1:00 to 4:00 in the afternoon. 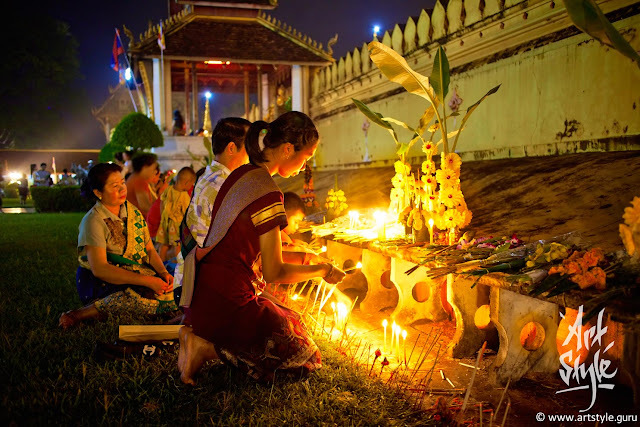 Before visiting and worshipping in the temple, if tourists dress shorts or short skirts, they will be lent sarong to wrap around the lower body.